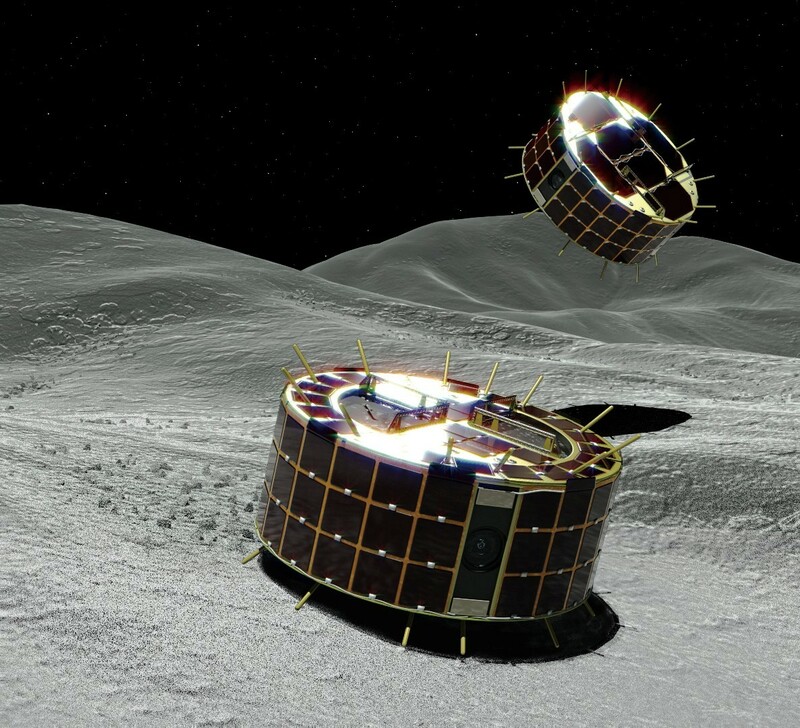 The MINERVA-II (standing for the “MIcro Nano Experimental Robot Vehicle for Asteroid, the second generation”) are a successor to the exploration rover, MINERVA, that was installed with the first Hayabusa mission to asteroid Itokawa. 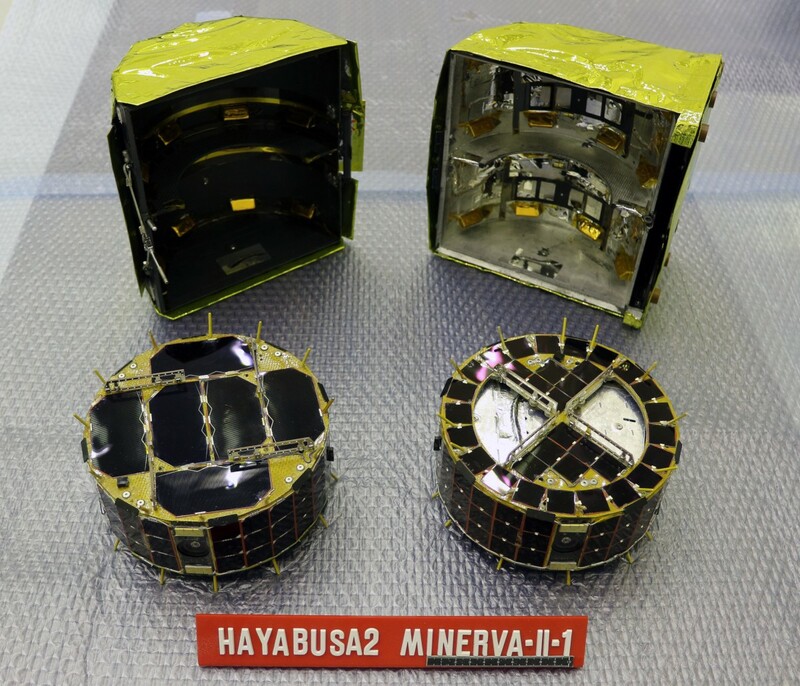 Two containers for MINERVA-II1 and MINERVA-II2 are mounted on the bottom of the Hayabusa2 spacecraft. Two rovers are stored within the MINERVA-II1 container and one rover sits in the MINERVA-II2 container (Figure 1). 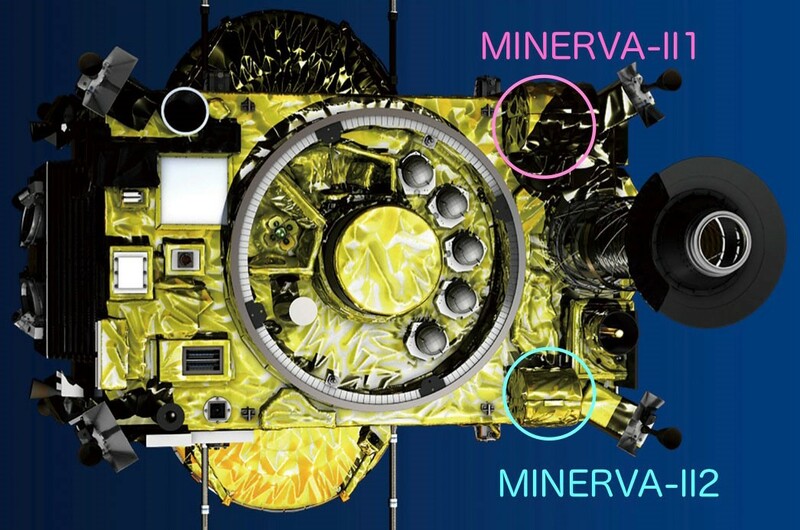 This September, the two MINERVA-II1 rovers within the first container will be deployed, while the MINERVA-II2 deployment is scheduled for next year. Aichi University of Technology, University of Aizu, Addnics corp, Antenna Giken Co., Ltd, ELNA, CesiaTechno, University of Tokyo, Tokyo Denki University, Digital Spice Corp, Nittoh Inc., Maxon Japan, DLR, ZARM. [open in another window] Figure 2: The small rovers, MINERVA-II1. Rover-1A is on the left and Rover-1B is on the right. Behind the rovers is the cover in which they are stored. (Image credit: JAXA). There are four cameras on Rover-1A and three cameras on Rover-1B. We are planning to use the cameras on each rover to create a stereo image of the surface of Ryugu. Some of the projections from the rover edge that looks like thorns are temperature sensors to measure the surface temperature of Ryugu. Additional instruments on the rovers include optical sensors, an accelerometer and a gyroscope. The rovers communicate with Hayabusa2 using the repeater (OME-E) installed on the main spacecraft. The maximum communication speed is 32 kbps. Data received by Hayabusa is then transferred to the Earth. The OME-E will also be used for communication with the German/French lander, MASCOT, scheduled for deployment in October. The main feature of MINERVA-II1 is the ability for the rovers to move on the surface of Ryugu by utilizing a hopping mechanism (Figure 3). Within the rover is a motor that rotates and causes the rover to “hop” (jump up) during the rebound. This will allow the rovers to move across the asteroid surface and explore multiple areas. On Ryugu, MINERVA-II1 will move autonomously, determining what should be done for the exploration by itself. Gravity on the surface of Ryugu is very weak, so a rover propelled by normal wheels or crawlers would float upwards as soon as it started to move. Therefore this hopping mechanism was adopted for moving across the surface of such small celestial bodies. The rover is expected to remain in the air for up to 15 minutes after a single hop before landing, and to move up to 15 m horizontally.